Heart Spot Yoga is a noncompetitive, peaceful and revitalizing yoga practice for every body. Expand your awareness of the present moment as you experience this integration of Hatha yoga with Don Stapleton’s Self Awakening Yoga. Breathe at a moderate pace to integrate the energy flow of your body. Chanting, pranayama, joyful movement and mindfulness bring relaxation and stress reduction. Strengthen your body, clear your mind, uplift your heart and spirit! Bhavanam, aka Bhavvy, discovered yoga with Mary Pafford in Ukiah CA in 1999. Relocating to Providence RI in 2002, he got his ERYT-200 from Eyes of the World in 2010. He was given the name Bhavanam by Don and Amba Stapleton to honor his RYT-500 certification from Nosara Yoga Institute in 2016. 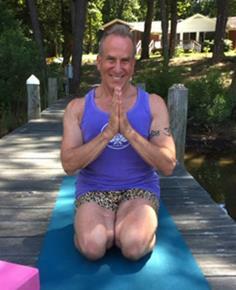 He owned a yoga studio, The Heart Spot, in Johnston RI from 2012-2018. His experience there guiding students through a gentle practice created Heart Spot Yoga. He also teaches Vinyasa yoga. He continues to study with Maryam Ovissi, Jafar Alexander, Lili Robins, Anne Petrov, Tom Gillette, Erik Strzempko and others. His classes focus on the balance of breath with body movement to create a sense of profound well being. Bhavanam (aka R. Bobby Ducharme) is also a theatre artist.